Perfect wintertime card Pat and a happy little snowman. Lovely card Pat, great cold colours and fab layout! It's a fab card Pat. One for the box for next Christmas already for you. I really mean to keep up with them all year this time. Last year was somewhat of a rush in the end. This is gorgeous Pat, love that corner die. Pat, what beautiful layering of those papers and love the snow swirl. Beautiful card! Hope your year is starting off well. That's one cute snowman Pat and I love those gorgeous blues. So cool and wintry. Have a wonderful weekend! "Hugs"
What a cute card! I love the snowman image and how you added the sentiment to the cloud! Thanks for playing at My Craft Spot! I love that cloud sentiment really makes a great finishing touch. ohhhh so cute. Love the layering you have done for this wonderful card. 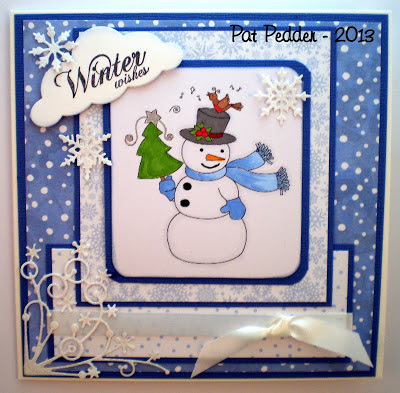 Gorgeous card Pat, loving the blues and this cute wee snowman.. Your corner die is fab and I too love how the sentiment is on the cloud. Pat: Cute, cute card! Thank you for joining us at Simply Create Too for our first 2013 challenge - "Let it Snow"! Can't wait to see what you create next challenge! Beautiful! Thank you so much for joining us at Love to Create Challenge last week!! Please Come back and Play again this week!! So pretty! LOVE your gorgeous colors! Thanks so much for joining us this week at My Craft Spot!!! I love snowmen - your card makes me smile and as usual, very well done!